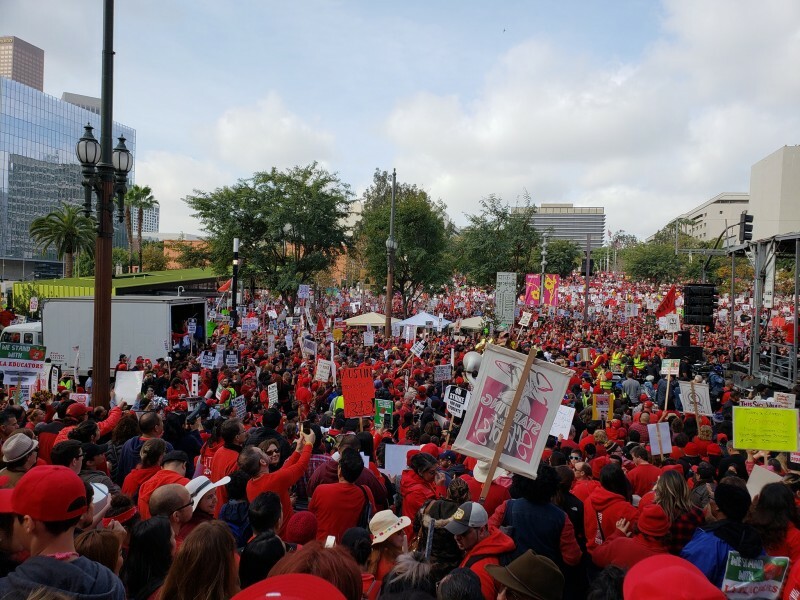 Massive show of union power on day 5 of UTLA strike | Fight Back! Los Angeles, CA - Day five of UTLA teachers strike started with citywide enthusiastic picketing at all LAUSD schools, January 18. The night before, parents held a protest outside the home of former Wall Street banker and school Superintendent Austin Beutner. Parents were angered that the LA police department showed up in full force to protect the representative of the super rich. Beutner is pushing a plan to “reimagine LAUSD” - a cover for dismantling and privatizing LAUSD. Leading a misinformation campaign, Beutner has misled parents about student absences. In the media, Beutner is making proposals while belittling the mass protest that has brought the country’s 2nd largest school district to a standstill. In the afternoon a mass rally was held on the steps of LA city hall while negotiations were underway inside. Los Angeles Mayor Eric Garcetti brought the LAUSD board and UTLA to the negotiation table. Garcetti opened LA city hall for the meetings, while the mass rally chanted outside. Thousands of teachers, staff, supporters, students and parents chanted, sang, danced and raised their fists in a broad show of unity and a militant spirit. The rally was led by Cecily Myart-Cruz, UTLA NEA vice president. Speakers included students and teachers. 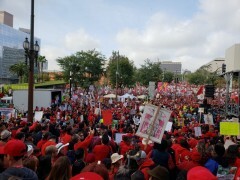 Alex Caputo-Pearl, the UTLA president, gave a rousing speech saying that UTLA is making history. Caputo-Pearl said UTLA has brought LAUSD and its top politicians to the ground. He asked all to continue the strong picket lines to win a victory for the whole community. The community group Centro CSO continued participation in the with the daily picketing in the early morning at Breed Street School in Boyle Heights. CSO members, along with the parents of LAUSD student Jesse Romero, who was killed by LAPS August 9, 2016, also participated in the UTLA rally. Negotiations continue and strike picket lines will resume Monday morning January 21.